Parker's HPLA actuators incorporate a high strength timing belt, guided by low friction, heavy-duty roller wheels, inside a sealed housing. Configurations are available with load capacities of 3000N, 6900N and 14900N. 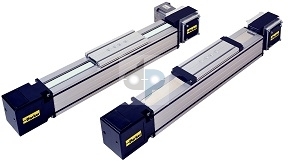 With speeds to 5m/s, HPLA's are optimized for high speed and are applicable in both single and multi-axis systems.